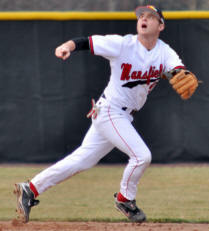 MANSFIELD – The Mansfield University baseball team will be looking for a bit of redemption and the chance to add some glory to the program’s storied history at the NCAA Division II Atlantic Region Championship Tournament starting Thursday at Owl Stadium in West Lawn, PA.
Mansfield is making its eighth regional appearance in Hillson’s 24 seasons at the helm of the program and its first since 2002. Hillson, who is one of the winningest coaches in Division II baseball with a 746-447-1 overall record, has posted a 16-9 mark in regional play and winning three regional crowns. Mansfield advanced to the Division II World Series in 1992, 1993 and 1994 playing in the NCAA Division II Championship game against Tampa in 1992. This year’s team (32-18) has its work cut out for it in the opening game on Thursday when the Mountaineers play defending Atlantic Region Champion and 2010 PSAC East winners West Chester (36-12) at 11 a.m.
West Chester won three-of-four games during the regular season and hold a 10-5 advantage over Mansfield over the past four seasons. The Golden Rams have the top hitting (.346), pitching (4.30 ERA) and fielding (.947) in the PSAC this season and are currently ranked 16th in the nation. Mansfield also features a strong hitting attack led by Chris Coleman with an average of .396 and is on a 24-game hitting streak. Coleman also leads the team in hits with 65. Coleman also has 39 runs, seven doubles, three homeruns and 45 RBI’s. Matt Hamilton follows Coleman with a batting average of .370, 52 runs, 57 hits, 16 doubles, one triple, six homeruns and 29 RBI’s with a slugging percentage of .604. Kevin Miller has a batting average of .364 with 50 runs, 60 hits, 14 doubles, one triple, three homeruns and 27 RBI’s with a slugging percentage of .515. Seth Tressler has a batting average of .343 with 32 runs, 46 hits, ten doubles, two triples, two homeruns and 26 RBI’s. Dan Chevalier has a batting average of .331 with 23 runs, 44 hits, nine doubles, two homeruns and 34 RBI’s. 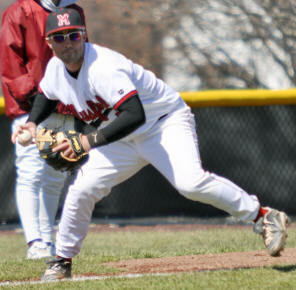 Jon Taddeo has a batting average of .326 with 31 runs, 43 hits, three doubles, two triples, six homeruns and 32 RBI’s. Taddeo also has a slugging percentage of .515. 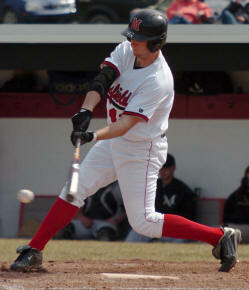 Mike Hartz has a batting average of .326 with 40 runs, 57 hits, 19 doubles, one triple, one homerun and 51 RBI’s. Glen Jenkins finishes the Mountaineer starting lineup with a batting average of .267 with 31 runs, 32 hits, 11 doubles, two homeruns and 23 RBI’s. Projected to start as a pitcher for the Mountaineers is senior Justin Garcia. Garcia is 3-2 on the season with and ERA of 4.97. Garcia has pitched over 50 innings this season striking out 26 batters with 13 of them looking. Bernard Johnson is also available as he is an All-Conference Relief Pitcher. Johnson is 6-3 on the season with 27 strikeouts and an ERA of 3.16. West Chester’s Jordan Lehman is the favorite for the Golden Rams to start. Lehman is 6-0 on the season striking out 45 batters with 12 of them looking. He also has an ERA of 3.39. West Chester’s batters all have batting averages over .300 except Bob Stumpo who has a .291. Joe Wendle has an average of .401 with 60 runs, 75 hits, 18 doubles, five triples, six homeruns, 53 RBI’s and a slugging percentage of .647. Kevin McGrath has an average of .380 with 61 runs, 70 hits, 14 doubles, five triples, seven homeruns, 38 RBI’s and a slugging percentage of .625. Brandon Wolfe has a .374 with 33 runs, 43 hits, ten doubles, one triple, three homeruns, 30 RBI’s and a slugging percentage of .557. Matt Baer has an average of .363 with 44 runs, 65 hits, seven doubles, three triples, 11 homeruns, 54 RBI’s and a slugging percentage of .620. Kyle Orensky has an average of .339 with 45 runs, 57 hits, 19 doubles, ten homeruns, 62 RBI’s and a slugging percentage of .631. Josh Heyne has an average of .331with 36 runs, 45 hits, ten doubles, one triple, two homeruns and 25 RBI’s. Nick Spisak has an average of .318 with 60 runs, 57 hits, 14 doubles, one triple, eight homeruns, 37 RBI’s and a slugging percentage of .542. Charlie Kelly has an average of .308 with 44 runs, 45 hits, eight doubles, two triples, nine homeruns, 35 RBI’s and a slugging percentage of .575. The game will be broadcasted live by Bob Michaels on RLM Sports. A live link to the page is posted on GoMounties.com.